St. James Volkswagen has a friendly and committed sales staff with many years of experience satisfying our customers’ needs. 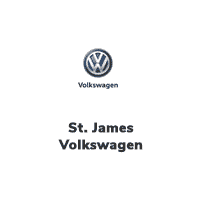 Located in Winnipeg, Manitoba, the staff at St. James Volkswagen will help you find the Volkswagen vehicle you want. At St. James Volkswagen, we offer a searchable online inventory of pre-owned, certified Volkswagen vehicles, along with very well-maintained cars, trucks and SUVs by today’s top manufacturers. Come visit us and take a test drive! Our sales staff will help you find that new Volkswagen or quality pre-owned vehicle that you have been searching for. For years, the financial staff at St. James Volkswagen has offered expert advice for those seeking an affordable Volkswagen purchase or lease. Our service doesn’t just stop there. Our valued customers can come in and take advantage of our knowledgeable, factory-trained technicians. With a convenient and comfortable all-season drive-thru, you can always expect a warm reception and cool refreshments in our air-conditioned customer lounge. We understand how much our customers love their Volkswagens. Whether you want to give your vehicle its own special flair, or give it that extra edge against cold Winnipeg winters, our friendly and knowledgeable Parts department is always available for you with a fully-stocked inventory of Volkswagen auto-parts and accessories. Owning a Volkswagen from St. James Volkswagen is something to smile about. We are committed to being friendly and approachable. We will always be open and honest. We will be consultative and provide honest information. We will listen with empathy and ask questions. We will provide a thorough explanation and avoid surprises. We will ensure everything is done right. And we will be in contact to confirm you are satisfied.